US Election guide: how does the election work? The U.S. Electoral College is made up of 538 members, representing all 50 states and the District of Columbia. States gain and lose electors based on Census data. (from London’s Daily Telegraph) – 314 million Americans, 50 states, two candidates and well over a billion dollars in campaign spending. How does the U.S. election work? The campaign comes down to one number: 270. That’s the number of electoral college votes [a candidate] needs to win and to claim the White House. The electoral college was created in the earliest days of the U.S. as a voting system that allows the disparate states to come together and elect a single president to represent them all. 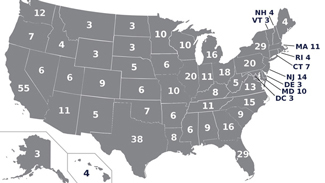 Each state, plus Washington DC, is awarded a certain number of electoral votes based roughly on size. California, America’s largest state [in population], gets 55 votes while sparsely-populated Wyoming gets only three. All but two states use a winner-takes-all system, so if you win the most votes in a state you take its entire haul of electoral college votes. There are 538 electoral college votes in total and the candidate to get a majority – 270 – becomes president. Strategists for Mitt Romney and Barack Obama have spent months and millions of dollars trying to figure out which combinations of states they need to win to get them over that crucial threshold of 270. So how do they go about reaching 270? The vast majority of America’s states are considered solidly committed to one party – for example California is unfailingly Democrat while Texas always goes Republican. But others, like Florida, Ohio and Iowa, are open to persuasion. The campaigns focused their time, their money and their resources on winning these swing states and voters there were bombarded with advertising and endless visits from the candidates. What happens on Election Day itself? On the morning of November 6, polling booths will open in all 50 states and in Washington DC and around 100 million votes are expected to be cast. Counting begins immediately and when voting finishes in the evening we will get our first glimpse of the exit polls, surveys carried out throughout the day that give an idea of who won. Usually by around 11pm on the East Coast it’s become clear that one side has prevailed. In that case the losing candidate calls the winner to concede. Both men will give a speech: one to claim victory and the other admit defeat. If Mitt Romney wins does he become president straight away? No. The next president will be publicly sworn into office on January 21, 2013, in an inauguration ceremony at the U.S. Capitol in Washington DC. If Romney wins he’ll spend the time between November and January – known as “the transition” – assembling his cabinet, his White House staff and preparing for government. If Obama wins his administration will largely stay in place, although he may decide to reshuffle his cabinet and aides for his second term. Are voters just casting ballots for the presidential election? No. As well as voting for president, Americans are also electing all 435 members of Congress’s lower house, the House of Representatives, and one-third of the Senate. Plus, they are voting for a medley of local and state officials. Information appearing on telegraph.co.uk is the copyright of Telegraph Media Group Limited and must not be reproduced in any medium without license. Reprinted here for educational purposes only. May not be reproduced on other websites without permission from the Telegraph. Visit the website at telegraph. co. uk. 1. How many electoral college votes are there in total? On what numbers are they based? 2. How many electoral votes does a candidate need to win the presidency? 3. What are “swing states” (also known as “battleground” or “toss-up” states)? 4. What is the “transition”? 5. How many members of the House of Representatives were also elected this election day? a) List the battleground states in the 2012 presidential election. b) List the winner of each state’s electoral votes, and the number of popular votes each candidate received. c) List the names and parties of the Representatives and (if applicable) Senators who won in your state. Who is the Representative for your district? The Electoral College is the institution that officially elects the President and Vice President of the United States every four years. The total of U.S. electoral votes is 538. A candidate needs 270 electoral votes to win the presidency – it’s half of 538, plus one. The number 538 is the sum of the nation’s 435 Representatives, 100 Senators, and 3 electors given to the District of Columbia. (i.e. Each state gets one elector per member of Congress.) e.g. Alaska gets three electoral votes, because there are two senators and one representative in Congress from that state. California gets 55 electoral votes, because there are two senators and 53 representatives in Congress from that state. A candidate who wins the majority of votes in a state gets all its electoral votes. The exceptions to this rule are Nebraska and Maine, where the state winner gets the two electoral votes derived from the two senators, while the candidate who wins each congressional district gets the electoral vote derived from that representative. Technically, the election of the president of the United States takes place during a joint session of Congress on January 6th following Election Day. That’s when members of the House and Senate meet in the House chamber to preside over the counting of electors’ votes. How many Presidential candidates lost the popular vote but won the election by winning the electoral college vote? George W. Bush 2000 (After disputed Florida electors were awarded to him by Supreme Court Ruling) over Al Gore. The last recount showed that Bush won.